The Duchess of Windsor was always on the list of the ‘best-dressed women in the world’… this would have been a positive drawback for her in England. Not since Queen Elizabeth I, with a dress for every day of the year, many of them embroidered with gems, has there been a queen who was a glass of fashion. The English probably prefer a royal family dressed in gumboots and head scarves, with sparkling bejewelled tulle for great occasions. The Duchess never wore gumboots. She was a femme d'interieur. When she and the Duke went to London at the invitation of the Queen to attend the unveiling of a plaque to Queen Mary… the Duchess in her Paris clothes looked like the denizen of another planet, among the flowery toques and pastel overcoats. She could hardly have been more unlike an English country lady. She did not care for games with the exception of poker and bridge, let along for sport, fishing, shooting or hunting. She liked flowers but not gardening. Agriculture passed her by. Her only exercise was dancing, or a short stroll with the pugs. She paid great attention to her appearance. observations: Who she sounds like is, Princess Diana. Maybe they would have got on well. Can’t see Prince Charles giving up a throne for love of anyone. Diana Mosley, one of the Mitford sisters, the one who married fascist would-be leader Oswald Mosley, writes very entertainingly and unblinkingly of the Duchess – this passage continues with other items that she liked or didn’t like and is both hilarious and affectionate. It’s also a very good way of painting a picture of her. The two couples were great friends in Paris, in effect all four expat pariahs, though they didn’t feel that way. Imagine being a fly on the wall when they had their little dinners: the ex-King of England, Mosley (the rare man whose politics meant he couldn’t live comfortably in the UK), and their elegant well-dressed wives, both devoted and loyal, all in beautifully-appointed Paris homes. All of them feeling that perhaps they hadn’t had the best out of life. King Edward VIII abdicated on this day in December 1936. His own memoirs gave us a blog entry recently. 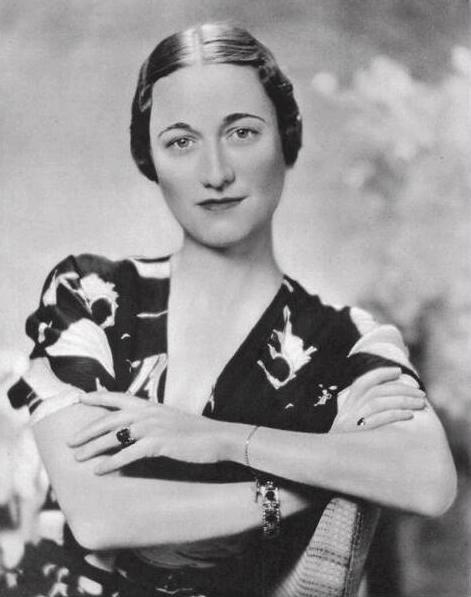 The picture of Wallis Simpson appeared in The Sketch newspaper a day or two before the Abdication. 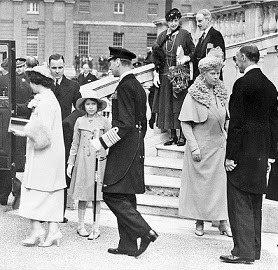 The picture of the Royal Family – including then King George VI and his wife Queen Elizabeth, their daughter the current Queen, and his mother Queen Mary – was taken at the opening of the Maritime Museum in Greenwich in April 1937, six months later. Moira - I think the Duchess of Windsor is one of the more interesting historical figures of that time, so I'm very glad you profiled this book - and its subject's style. I read a book about the Mitford sisters recently and their lives were fascinating. Diana seems to have evoked mixed feelings in people - very link the Duchess of Windsor. "She liked flowers but not gardening. Agriculture passed her by" - do you know said this. I have reference "30" in my book but when I go to find the reference list, it stops at 28! Thank you!!! Thanks for pointing out this anomaly, which I don't think I had noticed.